Can I integrate TutorCruncher with my website? Can I add a login page to my website? Can tutors sign up via my website? Can clients sign up via my website? You are able to connect your TutorCruncher account with your website in a number of ways. All of the website integration highlighted below is available on every price plan, so you do not need to pay extra to integrate your website with your TutorCruncher account. Yes, as your company account has a unique login page, you can direct your administrators, tutors, clients, or students to login via this page. You need to replace COMPANY_URL_BIT with your company's URL bit. This can be found by going to System > Settings > Agency Details and referring to the field named 'URL bit'. Once you have your unique company login page, you can add this link to your website. 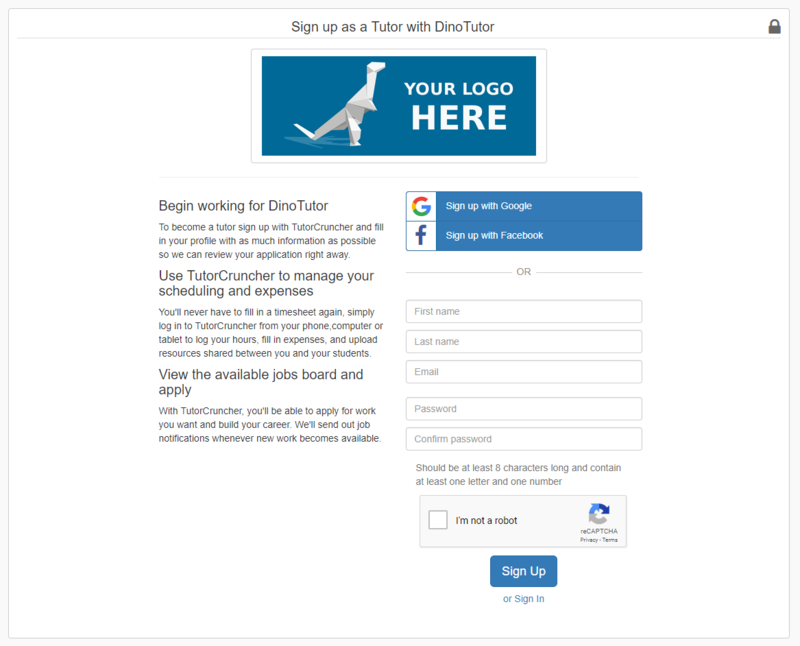 You can also add a tutor signup link to your website to help you recruit tutors. The location of this page is found at https://secure.tutorcruncher.com/COMPANY_URL_BIT/signup/tutor/. Please refer to the above section to clarify your URL bit. This page allows tutors to sign up for an account with your company as a 'Pending' tutor. You can customise the accompanying text description by going to System > Settings > Agency Details and editing the 'Tutor Signup Description' field. When a tutor fills in this page, they will create themselves as a 'Pending' tutor in your database. You can receive an email notification when this happens by proceeding to your System > Settings > Labels and selecting the 'Self Sign Up' label. You can specify an administrator to receive an email notification whenever a tutor signs up by selecting them in the 'Email Recipients' field. Using this link, you can encourage both prospective applicants and tutors you have contacted to create their own profiles without you needing to set them up with a login. You can also add a client signup link to your website if you want clients to create their own profiles on your account. The location of this page is found at https://secure.tutorcruncher.com/COMPANY_URL_BIT/signup/client/. Please refer to the above section to clarify your URL bit. Clients who sign up this way will be added as 'Live' clients, with the label 'Self Sign Up' automatically applied to their profiles. Clients are also able to sign up via the lesson booking process. With TutorCruncher Socket, you can List your tutors online, allow clients to enquire and directly request a tutor, and also allow clients to book lessons. Socket uses TutorCruncher’s API. If you wish to implement Socket on your website, then follow our setup guide. Feel free to check out this website for an example of how Socket could look on your website, as well as examples of different features of Socket in action. We offer web development services for companies looking for a new website that can be fully integrated with TutorCruncher. Look at dinotutors.com for an example of the kind of service that we can offer.